When Jarrod Saltalamacchia left the Red Sox to sign with the Miami Marlins, not only did he leave a void behind the plate in Boston -- he also left a vacancy in one of the team's more prominent philanthropic roles. And now, as the Sox get set to begin their season, that has been filled, too. The Dana-Farber Cancer Institute named David Ross and Will Middlebrooks its Jimmy Fund co-captains for the 2014 season, Ross taking over for Saltalamacchia alongside Middlebrooks, who was a co-captain last year, as well. In their roles, the catcher and third baseman will serve as ambassadors for the Jimmy Fund, aiming to raise awareness and support for cancer research and care at Dana-Farber. “We are thrilled that Will Middlebrooks continues to lend his support to the Jimmy Fund and to our adult and pediatric patients at Dana-Farber,” Suzanne Fountain, director of the Jimmy Fund, said in a release. “And we are so glad to welcome David Ross to be officially a part of our team. Thanks to the support of Red Sox players like Will and David, the Red Sox organization, and the citizens of Red Sox Nation, we continue to raise funds for cancer research and care." Ross joins a list of captains that has included Daniel Bard, Tim Wakefield, Clay Buchholz, Jon Lester, Dustin Pedroia, Kevin Youkilis, and Trot Nixon, plus Middlebrooks and Saltalamacchia, all of whom have joined with more Red Sox teammates by supporting events, thanking donors, and visiting clinics through the years. Among the duties of this year's co-captains will be serving as spokesmen for the ninth annual Rally Against Cancer fundraiser, during which Red Sox fans are encouraged to start a team at their workplaces or school. Team members then urge their co-workers, classmates, friends, whoever to each contribute $5 or more to the Jimmy Fund, and then "Dress for Sox-cess" by wearing Sox gear to school or work on April 4, in conjunction with the home opener at Fenway Park. Through the first eight years the Rally has raised more than $3.5 million, and this year organizers have set a goal of 525,000. The top-raising workplace and school are each eligible for a visit from Middlebrooks or Ross. The admiration between Aqib Talib and LeGarrette Blount was evident from the early days of their reuniting in Foxborough last spring, with Talib vouching for fellow ex-Buccaneer Blount with Bill Belichick before a draft day trade with Tampa Bay, then with Blount entertaining Talib while staying in the cornerback's guest house, then as they spoke about one another as each played a starring role at different points in the Patriots' season. So it was no surprise that when Talib signed a massive contract with the Broncos late Tuesday, Blount was happy to see his friend get paid. All well and good. A little brotherly love. And Blount's a free agent himself, so Talib's defection to Denver, specifically, probably didn't bother him nearly as much as it did most Patriots fans. He's in the process of trying to get paid himself, be it in New England or somewhere more generous. Except that when the line "BEST CORNER IN THE LEAGUE" is typed, antennas go up. People start to pay attention. And given the ego it takes to play that particular position at an elite level, those people include the corners themselves. So, after defending himself with a few folks who wanted to argue, and retweeting a series of others who agreed with him, the name of none other than Richard Sherman was evoked. And, as is Sherman's way, when his name entered the conversation -- so did he. Initially it was mild, with the Seahawks' star Tweeting at Blount, "hahaha I'm just messing with u man.... Bored." But Blount held firm to his belief. Sherman turned his attention to the NFL Network's Albert Breer for a while after that, lured in by Breer calling the since-Patriot-acquired Darrelle Revis the best corner in the league -- Sherman and Revis chatted about that on Twitter last year, incidentally -- but the next morning Sherman circled back to Blount's stance on his buddy, and that's when the fun really began. @RSherman_25 I've seen you do it & he has to. But he do it on both sides. He follow the best receiver on the field every game and strap him. @LG_Blount for what? So I can kill the integrity of the defense.... We actually have another good corner who I trust to do his job! We win! @LG_Blount did that help y'all win the bowl or nah? To that, unfortunately for the Patriots, Blount had no comeback -- and so that's where the conversation ended. For now, at least. A few days after talking to his beard while giving it a trim, Jonny Gomes officially said goodbye to his famed facial hair Wednesday morning. Appearing on Fox News' Fox & Friends, Gomes earned a $10,000 donation from Norelco to the Travis Roy Foundation by letting Elisabeth Hasselbeck take a couple of different razors to his face and give him a fresh start prior to the 2014 season. Gomes recently joined forces with Roy, the former Boston University hockey player who was paralyzed after sliding head-first into the boards on his first shift as a Terrier, but has since graduated from BU and raised millions to fund research and assist survivors of spinal cord injuries. "Travis Roy, a pretty amazing story, where he's come from and where he is now, and the tragedies he's gone through," the Red Sox outfielder said prior to his trimming. "What I'm doing personally is trying to raise as much money as I can, and what we want to do is just buy like a fleet of wheelchairs, hand carts, and buggies." The Boston Red Sox are ... World Series champions. But, did you also know the New England Patriots are ... cheaters. The Boston Bruins are ... a dirty team. And the Boston Celtics are ... old. Well, at least according to Google. Spurred on by a map showing the most popular Google autocomplete suggestions were for cities in Massachusetts, which was spurred on by a map pinning each U.S. state with its biggest stereotype, we decided to plug some of Boston's most prominent and provocative athletes and executives into the search engine and see what turned up. What showed at the top of the list for each of the region's four most popular teams is above, but which individual is considered "cute?" Which former star might be better known for his movie roles than his hall-of-fame career? Who is closely associated with an obscure musical instrument? Who is both overrated and underrated? And whose brush with controversy may have altered his results, and perhaps his public perception? Click through to the jump, then hover over the headshots to see what Google proposes for a search on each of the depicted, keeping in mind that the autocomplete suggestions can change based on location, and do try to account for more recent news, but are ultimately based on real searches that have been done by its users. 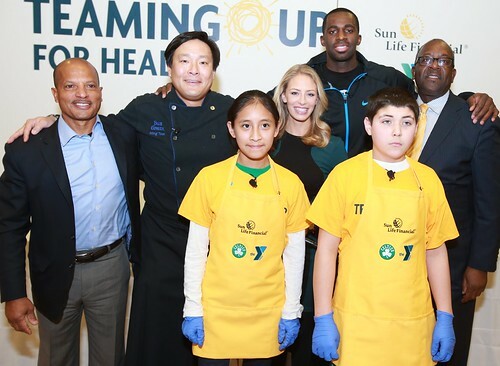 Celtics forward Brandon Bass recently joined assistant coach Walter McCarty and renowned chef Ming Tsai for a Sun Life Financial-sponsored event aimed at preventing diabetes by helping kids establish healthy habits at a young age. The 28-year-old, who last summer enlisted in swimming lessons in part to inspire local youths, offered to share his reflections on last Thursday's appearance and its lessons. 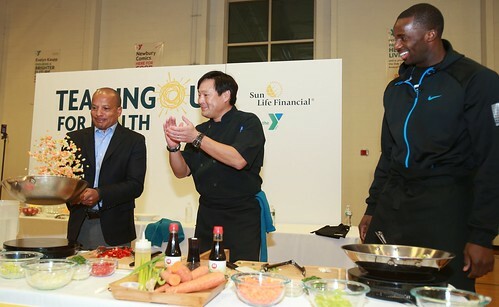 While being a Celtic and preparing day in and day out to play my best on the court takes up a majority of my time, I also know how important it is to connect with kids in the community, and last week I got the chance to help out at a diabetes prevention event at the Oak Square YMCA that was put together by Sun Life Financial. Sun Life is a partner of the Celtics and they are a big supporter of the Y’s Diabetes Prevention Program, so they brought me and coach Walter McCarty over to help teach Boston kids and their families fun and simple ways that they can get some more activity into their daily routines. Chef Ming Tsai was also there to show how to make healthy meals, and I’m not going to lie, getting to show the proper technique and eat Ming’s nutritious meals was certainly a job I’m well qualified for. Lucky for Chef Ming I have a day job. Man can he cook! But in all seriousness, it’s great helping to teach people to understand how important it is to eat right and stay fit. After all, the bottom line for me is that there’s no chance I’d be playing in the NBA without following these guidelines myself. After the event, I went home to my family, and got to thinking about how grateful I am that I’ve been able to take what I know about exercise and nutrition and use that to help with some of the decisions we make at home for my kids. As a father of two, it’s great to watch my kids try out new activities, and start to show an interest in sports. It just so happened though, that the one sport my 6-year-old son enjoys the most was one that I couldn’t help him with: swimming! I never learned to swim, and in fact, Brandon Jr. is the first one in our family to learn. My daughter showed an interest as well, so I decided that if they could take the plunge, so could I, and we started taking swimming lessons together. At first, I was nervous about even learning how to float, let alone swim, but now I enjoy it almost as much as my son. As I got better at the basics, I started thinking about how easy it is for someone to get stuck in their ways when it comes to fitness. As a pro ball player, my commitment to fitness comes with the territory, but I can get tunnel vision when it comes to switching up my routine. I’ve always been a weight room and basketball court kind of guy, but when I started branching out into swimming, I realized how much it could help with my workouts and how important it is to try out different exercises, that focus on different muscle groups. With obesity and diabetes in America climbing, the idea of changing up your routine is more important than ever. Kids these days are putting aside physical activity for video games and TV, and that has got to change. They have to be taught how important it is that they are active for at least a little bit each day. In my personal life I try to push myself to be an example for my children, and in my professional life I try to promote healthy lifestyles to kids everywhere, like the event last week with Sun Life and the YMCA. Events like this are great to get the conversation going about being healthy, and I’m excited to take part in many more. Who knows? Maybe next time I’ll lead a swimming clinic! Above: Bass has a laugh while Tsai cheers the culinary skills of Sun Life president Wes Thompson. Below: Thompson, Tsai, and Bass are joined by host Jenny Johnson, YMCA of Greater Boston CEO Kevin Washington, as well as YMCA participants Marta Bonilla and Brendan Sutliff. Now that football season is finished, the other inhabitants of Gillette Stadium are just starting to get ready for their own business. And in that vein, the Revolution will as an organization be busy over the next week building support -- and, specifically, choosing supporters -- for their efforts in the coming season. Wednesday and Thursday nights, the local MLS entry will hold the final rounds of auditions to join its Rev Girls promotional team, first taking three from the Boston area, then three more from the Providence area a night later. Wednesday's contest will be held at The Greatest Bar on Friend Street in Boston, from 9-11, with Dirty Water TV's Sophia Goulet hosting the festivities, and the panel of guest judges including Olympic judo champion Kayla Harrison, 2013 Miss Massachusetts Amanda Narciso, Melissa from Hot 96.9 FM, and WEEI producer Ben Kichen. They'll be watching as Allison Bergeron (Nashua, N.H.), Brandi Bishop (Medford), Lauren Laperriere (Gardner), Alexandra Paz (Chestnut Hill), Michelle Spiry (Sturbridge), and Jennifer Swain (Concord) answer Revolution trivia, participate in a question-and-answer session, and interact with fans at the bar. Thursday night the contest moves to the Rí Rá in Providence, where Adrianna Coelho (Westborough), Meghan Larrat (Saunderstown, R.I.), Jamie McIntyre (Cranston, R.I.), Jenna Pare (Tiverton, R.I.), Margarita Propper (East Providence, R.I.), and Kelly Villa (Pawtucket, R.I.) compete for the three remaining spots on the Rev Girls roster. Their event will be emceed by former American Idol contender Erika Van Pelt, and judged by WPRI Rhode Show host Will Gilbert, 2013 Miss Rhode Island Jessica Marfeo, the Providence Journal's Jena Pelletier, and Jessica Schiano from 92 PRO-FM. Both nights fans are welcome to view the contest and cheer on their favorites in an effort to influence the judges' decisions. Then next week, the players themselves hit the bars to party with the people as the club embarks on a pub tour between preseason tilts. There's no cover charge for any of the events, and each will include a chance for those in attendance to win tickets to the Revolution's March 22 home opener. The tour's first stop is Feb. 11, at The Banshee in Boston, where Jose Goncalves, Lee Nguyen, and Chris Tierney are scheduled to appear from 7-9 p.m. That event is 21-plus, though the next two nights are open to fans of all ages. The first is Feb. 12 at the CBS Scene in Foxborough, which runs from 6-8 p.m., with Diego Fagundez, Dimitry Imbongo, and Saer Sene all slated to be on hand. And finally, on Feb. 13, it's back to Providence and the Rí Rá from 7-9, with Kevin Alston, Scott Caldwell, and Andrew Farrell all signed up to participate. Then it's back to business, as the team heads to Arizona for three preseason matches in the span of a week before kicking things off for real at Houston on March 8. As teammates with the Patriots, Wes Welker and Matt Light played in two Super Bowls together. Now, as Welker tries to get to the big game again -- this time by beating the Patriots as a member of the Broncos -- the receiver and the offensive tackle are teaming up again. To benefit each player's respective foundation, they're holding a raffle that will send a winner and three guests to Sunday's AFC championship game with all expenses paid and a chance to meet Welker for photos and autographs. "We thought this was a great way to join forces to help at-risk kids who need a helping hand," Light said. "We couldn’t imagine a better football rematch – the Patriots against the Broncos in Denver – all for the chance to advance to the Super Bowl. It’s a ticket everyone wants!" Both the Light Foundation and the Wes Welker Foundation are centered around the joint mission of improving the lives of young people and helping them to become leaders, and their Celebrities for Charity raffle runs through Friday at 3 p.m. Tickets are $2 each, with a minimum of five chances per person, but no maximum. cash to cover the tax obligations. Light won't be in Denver for the game, as he is instead hosting a viewing party at Toby Keith's I Love this Bar & Grill at Patriots Place in Foxborough, beginning at noon. Admission is $30, with all proceeds going to the Light Foundation, and the party will feature live music, trivia, celebrities, football squares, raffles and giveaways. Welker, conversely, will be in Denver. Just not wearing the uniform most Patriots fans would prefer. 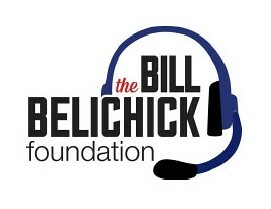 With a mission to "bring the values of the Belichick family – a love of sports, coaching and team building – to the athletic leaders of tomorrow," the Patriots head coach officially launched the Bill Belichick Foundation on Wednesday, formally expanding his philanthropic endeavors to provide coaching, mentorship, and financial support to individuals, communities, and organizations focused on football and lacrosse. The release made mention of Belichick having grown up watching his father coach and scout, and also noted that two of Belichick's own kids have gone into coaching -- daughter Amanda is the interim head women's lacrosse coach at Wesleyan University, while son Steve is a coaching assistant with the Patriots -- so the suggestion is that the foundation will be a family effort made in honor of the ideals established by its patriarch. In fact, Belichick's girlfriend, Linda Holliday, is listed as its executive director. We'll assume the timing of the foundation's launch didn't distract the coach from the task at hand with his team -- "It's on to Baltimore," if you haven't heard -- but rather was coordinated to help promote the raffle that will kick off its fundraising efforts, even as the Pats attempt to wrap up the AFC East, and potentially secure a first-round bye in the playoffs. From now through 2 p.m. on Dec. 27, the foundation will be selling tickets for a chance to win a "once-in-a-lifetime" Patriots game package that includes two tickets to the regular-season finale against Buffalo (in a luxury suite hosted by Holliday), a room at the Renaissance Hotel at Patriots Place the night before the game, parking, pregame field passes, and a meet and greet with the coach himself. Taxes and (at least a portion of) travel fees are also included, and chances to win cost just $2 apiece, with a minimum of five required, but no maximum to how many chances each person can purchase. Click here to buy those from Celebrities for Charity, or for additional details. His ACL and MCL may be shredded, and surgery awaits him soon after the holidays, but it seems as though Rob Gronkowski's spirit remains intact. According to the video that Santa-suited teammate Stevan Ridley posted to Instagram, Elf Gronk and the Patriots' running back paid a visit to Children's Hospital today to visit with patients. Naturally they dressed up in full costume -- Ridley enjoys wearing onesies no matter the season, actually -- and even resigned to a wheelchair the Pats resident man-child seemed to be enjoying himself. Perfect for this time of year, he's nothing if not merry and bright. Just before Thanksgiving, the Bridgewater Badgers peewee football team made national headlines by standing up to bullying with a unified show of support for their 6-year-old "water coach," Danny Keefe, who suffered a brain hemorrhage shortly after birth and subsequently has a speech impediment. Danny was being teased because of the way he talks, and when the Badgers heard that this was happening, they decided that it needed to stop. They organized a "Danny Appreciation Day," during which 45 boys wore a suit, tie, and fedora to school like Danny does, and thereby delivered the message that it wasn't okay to pick on him -- or anybody else, for that matter. As soon as the media heard this, the story went deservedly viral, and eventually the news made its way to Ellen Degeneres -- who happens to have some connections a couple of New England football fans could certainly appreciate. Ellen invited 6-year-old Danny and 11-year-old Tommy Cooney, the Badgers' quarterback and the impetus behind the big day, to be celebrated on her talk show in Los Angeles this past week, and before their segment was complete the two boy heroes received a video message from a hero of another sort they hail back home. It was Patriots quarterback Tom Brady. "Hi Danny and Tommy. I hope you guys are having fun in LA with my friend Ellen," Brady began his recorded message. "I heard about your story and I can't imagine how proud your parents must be. Danny, people still tease me about what I wear -- but I never listen to them, so keep wearing what makes you feel best. "And, Tommy, I love your leadership and how you stood up for Danny, and I applaud the entire Bridgewater Badgers team for participating. I hear you're both big Patriot fans, so I'd love to give you guys some tickets to our regular-season finale against Buffalo in a few weeks, and give you some pregame field passes, too." Brady also tells the boys that Pats owner Robert Kraft will give the entire Badgers team tickets to the Hall at Patriots Place -- news that left their mouths agape. After their segment, Danny took the aisles to do some dancing, and then they sat down to recap the experience with one of Ellen's producers. "Really, really, really -- really, really, really -- awesome and crazy!" Danny said. If you saw the gigantic high-def video board that stretches from 20-yard line to 20-yard line above the field at the Cowboys' AT&T Stadium in Dallas, and your first thought was, "Wow, I'd love to play Madden on that thing" -- you may want to join the Patriots' Kenbrell Thompkins at Best Buy in Braintree on Wednesday night. As a cancer survivor, an advocate for those waging their own battles with the disease, a three-time Super Bowl champion, and even more recently as one of the civilian heroes who sprung to action in the immediate aftermath of the Boston Marathon bombing, former Patriots lineman Joe Andruzzi has a unique perspective on why it's important to be appreciative on Thanksgiving. As he prepares to host his foundation's annual New England Celebrities Tackle Cancer Gala next week at Gillette Stadium, we asked him to share that perspective, as he did last year. Thanksgiving is here again, bringing together so many things I love: good food, gathering with family and friends, football… and the opportunity to once again reflect on everything I’m grateful for. I have been cancer-free for six years now, and the Joe Andruzzi Foundation has spent those years helping patients and families struggling with cancer. With every year, I’m more appreciative I’m still here, and that my wife Jen and I get to do this work. I’ve been here to watch my kids grow. And I’ve also watched our foundation grow from a simple idea sparked by our own experience to a nonprofit raising hundreds of thousands of dollars to help alleviate cancer’s financial burden on patients. It’s been quite a ride. Being diagnosed with cancer in 2007 taught me a lot. In an instant, I learned first-hand how unpredictable life can be, that you never know what’s around the corner. One minute, I was a professional football player with the Cleveland Browns, coming off three Super Bowl wins with the New England Patriots. The next, I was listening to my doctor tell me I had a very aggressive form of non-Hodgkin’s Lymphoma – and a tumor expected to double in 24-hours. And just like that, Jen and I were headed back to Boston for treatment at Dana-Farber Cancer Institute, our four kids (now five) in tow. It was a life-changing event for our family, but it created a new mission: helping patients and families fight cancer, financially and emotionally. This year’s Boston Marathon was another poignant reminder that tragedy can strike when we least expect it. That day, our foundation set out to do two things: cheer on Team JAF’s 21 marathon runners, and to raise crucial funds for cancer patients and their families through a Marathon Monday Fundraiser at Forum Restaurant on Boylston. When the blasts went off, Jen and I were at the finish line greeting one of our charity runners. Realizing the second bomb went off directly where our event was, and not knowing the status of all of the people at Forum, is an indescribable feeling that many of us will never fully shake. In one second, the day went from joyful to horrific. We once again found ourselves drawing on the lessons cancer taught us – that we must pull together, help each other and treasure our time together. That we must remain positive and upbeat, even in the darkest times. Especially in the darkest times. We focused on the heroism of our city that day – the first responders who rushed towards chaos to save lives, the medical staff that tended the wounded, and the regular folks who opened their homes to shell-shocked runners and spectators. And we celebrated our Team JAF runners – and all of the 117th Boston Marathon participants – by returning to Boylston Street a few weeks later, to finish the race. Next April, we’ll be back at Forum, cheering on Team JAF, as it tackles the 118th Boston Marathon. We want to finish what we started. We’re thankful for that opportunity. We know our work matters, and it strengthens our resolve to move forward. This year, our foundation helped more patients and families than ever, bringing the total number we’ve assisted since 2008 to more than 1,000. In that same time, we’ve donated more than $400,000 to fund pediatric brain cancer research at Boston Children’s Hospital, in honor of a young friend claimed by cancer, C.J. Buckley. We have also expanded last year’s successful Touchdowns by Tom campaign into Points for Patients, partnering once again with National Grid, which is donating $500 for every touchdown scored by the Patriots this season. It’s also matching public donations to the campaign, dollar-for-dollar up to $75,000. I always cheer for my former team, but it’s been especially awesome watching this season, knowing each touchdown helps cancer patients and families. Our program also sends cancer patients to games. Last month, I was honored to sit alongside 16-year-old Devin Depauw of Hanover Woods, as he and his best friend forgot cancer in the excitement of a cliff-hanging Pats vs. Saints game. When it comes down to it, those are the types of moments we’re most grateful for. Next Monday (Dec. 2), after all the turkey and pie settles, our community will come together once again at Gillette Stadium for our annual New England Celebrities Tackle Cancer Gala. Last year’s benefit generated an incredible $500,000, and this year, we’re aiming to raise even more. I’m still in awe of how far we’ve come in six years, and humbled by our collective power to help others – we’re incredibly grateful to all those who have joined us on this journey. And I’m looking forward to many more happy Thanksgivings to come, for both my own family and those we serve. Tickets for the Sixth Annual New England Celebrities Tackle Cancer Gala, scheduled for Dec. 2 at Gillette Stadium, are available here. 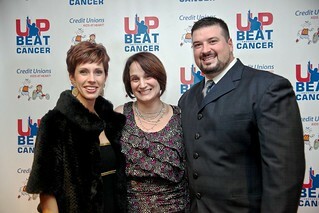 For more information on the Joe Andruzzi Foundation and the Gala, visit the JAF blog or www.joeandruzzifoundation.org. To learn more about the Joe Andruzzi Foundation, visit the Foundation’s website, Facebook and Twitter pages. About a year ago, a few members of the Patriots took on some of the Giants in Halo 4 -- the latest edition of the incredibly popular, interstellar war video game. New England lost that battle last November. And now the Pats are turning on themselves. At Royale Boston on Dec. 11, tight end Rob Gronkowski and quarterback Ryan Mallett will go head to head, each leading a team of gamers in the finals of the Celebrity Gaming Challenge -- the proceeds from which will benefit the Gronk Nation Foundation and the Miller McNeil Woodruff Foundation. The tournament actually begins a few days earlier, with preliminary rounds at the Microsoft stores in Salem, N.H. (Dec. 6), Natick (Dec. 7) and Boston's Prudential Center (Dec. 8). Contestants will play as singles at that point, proceeding through a round-robin elimination tournament that will eventually whittle the field down to two winners from each of those locations, then those players will advance to the finals, where they'll be drafted onto the teams led by Gronkowski and Mallett. To register for the competition, go here, or if you just want to watch the competition and see for yourself whether Gronkowski or Mallett is the superior Xbox athlete, go here to buy tickets to the finals for $20 apiece. Winners of the tournament will each receive a new Xbox One system of their own, while helping to raise money for the Patriots' causes. The Gronk Nation Foundation strives to empower kids in order to help them maximize their potential, while the Miller McNeil Woodruff Foundation aims to raise awareness, fund research, and offer support to families facing the challenge of Spinal Muscular Atrophy. Both are certainly worthy missions. And you never know what Gronk might do at one of these events. Especially in the heat of competition. 'Tis the season to try and find unique and meaningful gifts for those special people in your life -- and the Dana-Farber Cancer Institute and David Ortiz both might be able to help you with that as they help others. The recently minted World Series MVP will host his sixth annual David Ortiz Celebrity Golf Classic next month, and from now through Dec. 14 his foundation will hold an online auction to support its mission to provide pediatric health care in the Boston area in his native Dominican Republic. There are nearly 70 items up for bid, including a hitting lesson from Ortiz himself, a round of golf with Hall of Fame linebacker Lawrence Taylor, a chance to have former Yankee Bernie Williams coach your child's Little League game, dinner with comedian Lenny Clarke at Strega Waterfront, as well as meet and greets with a variety of big leaguers and several once-in-a-lifetime opportunities at Fenway Park. Dana-Farber and the Jimmy Fund, meanwhile, will be marking "Giving Tuesday" -- which follows Black Friday and Cyber Monday on the calendar -- by selling a holiday collection of original cards, candles, ornaments, and jewelry to benefit adult and pediatric care and cancer research at DFCI. The highlight may be the cards designed by local artists and Dana-Farber patients, while sports fans might be most interested in the Red Sox- and Patriots-themed candles and ornaments -- including one handcrafted keepsake that commemorates the Sox' 2013 World Series championship. After the holidays, Sox players will personally help with the fundraising when some of them participate in the annual "New Stars for Young Stars" party, where they'll be signing autographs among the festivities at Jillian's Boston. Come to think of it, tickets for that might make a good gift, too. Tickets for that event go on sale Monday. If the Red Sox finish the Cardinals over the next couple of nights, and become the champions of baseball, there's a pretty good chance David Ortiz will come away with World Series MVP honors in addition to his third championship ring. After all, he's in the midst of what may be the greatest Series a hitter has ever experienced. He's slugged a couple of homers. He's reached base 75 percent of the time he's come to the plate. He's collected 11 hits in five games. He's put his (bleeping) city on the verge of a parade. And you could win his authentic, autographed jersey. Anyone who "likes" the Facebook page of the Dana-Farber Cancer Institute before Friday (Nov. 1) will be entered in a contest to win the jersey signed by the Sox' gregarious slugger, which he donated to help celebrate the 60th anniversary of a partnership between his team and the Jimmy Fund that has seen scores of players make visits to the clinics and assist in fundraising initiatives through the years. To be eligible, participants must be at least 18 years old, they can only enter once, and the rest of the official rules are available by clicking here. For the past five years, Major League Baseball has used the spotlight on the game during the World Series to raise awareness for causes it deems are important -- dedicating Game 1 to saluting veterans and military families, and Game 2 to shining the light on organizations that impact lives, and so Thursday MLB and a few former Red Sox are making three community appearances today in support of that mission. The highlight comes in the afternoon, when a delegation headed by MLB Commissioner Bud Selig heads to Spaulding Rehabilitation Hospital at 2:30 to visit with veterans from the Home Base Program -- which is a joint effort between the Red Sox Foundation and Massachusetts General Hospital. Joining Selig will be a Red Sox contingent including Chairman Tom Werner, Hall of Famer Jim Rice, and two-time (in Boston) World Series champ Mike Timlin, as well as MGH President Dr. Peter Slavin, and Home Base Program Executive Director Brigadier General Jack Hammond. It will be the second appearance of the day for Timlin, who was in Dorchester Thursday morning for a ribbon cutting at the site of a Habitat for Humanity home that's been built on Blue Hill Avenue. In partnership with Somali emmigrants Mohamed and Safiyo Bule, as well as their five children, Habitat Greater Boston is constructing 24 new condo units on Blue Hill Avenue and Intervale Street, revitalizing a lot that had been vacant since the 1960s. Four of the five planned buildings have been completed, including the one Timlin helped unveil. Another of Timlin's buddies from the bullpen that helped the Red Sox beat the Cardinals in the 2004 Series was also part of the day's festivities, with Keith Foulke joining a group that went to the Roslindale Community Center for a "Wanna Play" event put on by the Boys & Girls Club of America. Wanna Play is a billed as a multi-faceted initiative with a fitness curriculum dedicated to increasing fitness and nutrition education among boys and girls ages 5-13, while also teaching the fundamentals of baseball and softball. With both of them in town, it's a pretty safe bet Timlin and Foulke will be two of the players from the '04 champs that'll throw out ceremonial first pitches prior to Game 2. Curt Schilling and Kevin Millar will be on site for ESPN and MLB Network, respectively, so count him them in, too, while Tim Wakefield, Pedro Martinez, and Jason Varitek all work for the Sox front office now. Will the MVP of that series against the Cardinals be at Fenway, though? We'll have to wait and see. From time to time, a pro athlete will make a public appearance that puts him in an environment where he's not entirely comfortable with his surroundings, and the circumstances can make things sort of awkward. However, Rob Gronkowski's visit to Harvard Stadium on Nov. 11 is not likely to be one of those events. Centered around football, women, and adult beverages -- three favorite features of many a single man in his mid-20s -- the Patriots' tight end will host the inaugural Citi Rob Gronkowski Football 101 Women's Clinic on the Monday evening coming out of the team's bye week, joining with area high school and college coaches to direct activities at an event that promises a "focus on football basics with a social twist." When female Citi Card members who pay $99 arrive at 5 p.m., they'll first partake in a cocktail hour, where they'll have access to Gronk-tinis -- the ingredients will be left to your imagination -- along with beer, wine, and food. After that they'll move on to the football clinic, where they'll separate into small groups and go station to station working on football fundamentals and competing in skills competitions. They'll do that until 8, and then it's time for coffee and dessert. The consummate post-game snack. Before they leave, participants -- who must be 21 or older -- will also hear Gronkowski "give talks highlighting the finer points of the game of football and beyond," as well as take a team photo with the tight end, have the opportunity to win prizes, and go home with an authentic autograph and a T-shirt. Not a bad little "ladies night out," as organizers are calling it, and the capper to a full weekend for Gronkowski and the customers of Citi Card. 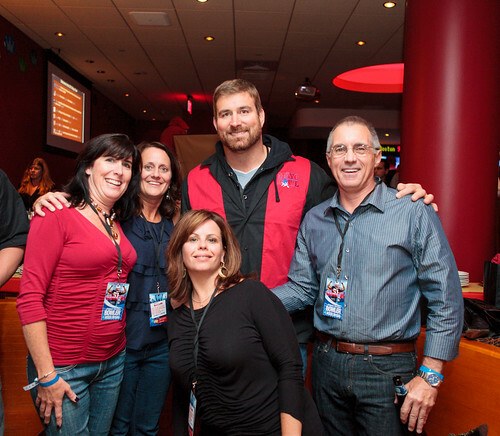 A day earlier he's holding a football camp at Medfield High School for kids in grades 1-8, then that night, he'll be watching Sunday Night Football with Citi Card holders at Bar Louie in Patriots Place, taking pictures, signing autographs, and interacting with everyone who pays $87 to spend the Pats' idle Sunday with one of the team's stars. So it'll be a busy bye weekend for Gronkowski. But at least this time his activity during the team's time off isn't likely to leave him feeling like he shouldapologize to ownership. The saga revolving around Rob Gronkowski's prospective return to the Patriots after several surgeries on his arm and back cost him at least the first six games of this season took another strange turn Friday, when BODYARMOR SuperDrink -- one of the products he endorses -- released a video in which the Patriots' tight end talks about how ready he is to get back on the field, how hard he's working, and how important it was that he rehab properly. "Obviously I went through a lot of hectic, emotional, stressful events with injuries -- but it's something you've got to deal with," he says in the video embedded above. "It's a contact sport, every single play, and I'm just looking at my future now. "When you're hurt, you just really don't feel part of the team. You go in every day, see everyone -- and I just see the guys working every day, out at practice, and that motivates me, too, to see my teammates grinding every day and I'm not out there grinding with them." In recent weeks, there have been reports of a disagreement between the team and Gronkowski concerning his availability. There were other reports claiming that there were differences of opinion among doctors about Gronkowski's health. Last week, Fox's broadcast team made a point of mentioning early in their show how good Gronkowski looked in practice leading up to his absence in last week's Patriots-Saints game. And there were allegedly teammates agitated by Gronkowski remaining out of games while looking good behind the scenes. Bill Belichick doesn't typically have much patience for those types of leaks, which lead to innuendo and unnecessary distraction. The coach would just as well prefer never to talk about injuries, and he took that tact himself earlier on Friday when asked for a response to text messages sent by Gronkowski's agent saying the tight end was now medically cleared. But perhaps, knowing he'd have to talk at some point, this was just his way of making a prepared statement that addressed all the issued raised by those various rumors and reports. And rather than stand at a podium, or pull a Jacoby Ellsbury and awkwardly read from notes at his locker, he and his handlers opted instead to do it in a more polished, more controlled, more measured presentation -- one that also happened to help out one of the companies in which he is a partner. It eliminated the chance of saying something silly, or staggering in front of the microphones, and was essentially a way to not only control the message, but to control the manner in which it was delivered, and to make sure Gronkowski came across sincere in his concerns and in his commitment to his team and his teammates. And if that's the case, who knows, this might even have been pre-approved by the Patriots -- who ultimately should be most concerned first and foremost with getting and keeping one of their best players back on the field. Based on Gronkowski's comments on the video, it appears a distinct possibility it'll happen this Sunday in New Jersey against the Jets. "It's not just the arm, it's the back, too. You've got to rehab both, and both is a process of weeks. It's every single day for eight weeks -- or the rest of my life I'll be doing physical therapy," Gronkowski says in the video, before the dramatic music is turned up a little louder as it rolls over clips of him tying his shoes, lifting weights, and training. "You might think that we just show up and play on Sunday, but there's so much behind-the-scenes process that goes on in order to get back out on the field, and it's literally rehab, rehab, practice, running, conditioning, strengthening all the muscles, strengthening your core muscles. And it's not just my back muscles, my arm muscles, it's my whole body. "I feel so much better than I have the past few weeks. Compared to last week right now at this time, I feel great. And, say, last week compared to the week before that, I feel great. That's the only thing you can ask for is progressing every single week. "I had it taken away from me at college, I had it taken away from me at the end of last year, and now I had it taken away from me at the beginning of the year -- the game of football. It's going to be a great feeling to run back out there, through that tunnel, and get back out on the field with them." It's fair to assume that after striking out four straight Rays on Tuesday night, and picking up the win thanks to an excellent relief appearance that spanned parts of three innings in the contest that clinched the American League Division Series, Craig Breslow picked up some new fans among Red Sox Nation. His longtime advocacy for the cause earned him a nomination as this season's Red Sox candidate for Major League Baseball's Roberto Clemente Award -- which went to Boston's Tim Wakefield and David Ortiz in 2010 and 2011, and annually honors the player who best represents baseball on and off the field -- Breslow could potentially collect that award before a World Series game he's playing in. And now it appears as though he's even more inspired to make that happen. Even before he emerged as the best closer in the American League, Koji Uehara had become a favorite of Red Sox fans with the way he shared his infectious excitement with his teammates, and came off the field firing high fives in all sorts of directions after getting out of an inning. It was six years ago this month that Doc Rivers asked Paul Pierce, Kevin Garnett, and Ray Allen to join him for a ride around Boston on a duck boat, the message behind the meeting unmistakable. The coach wanted to show the Celtics' captain and the team's two prized acquisitions the city's ultimate victory vessels, explaining that when titles are won in this town, that's how the champions are paraded through the streets. With Rivers in Los Angeles, Allen in Miami, and Pierce and Garnett both in Brooklyn, nobody expects a new-look Celtics team to be requiring use of the duck boats come early summer, like those legends did in 2008. But eight of the new players will begin their time in Boston the same way Garnett and Allen did, boarding the ducks Wednesday afternoon for a tour of the city -- and, additionally, supporting the team's Read to Achieve Program in the process. The players will read "Make Way for Ducklings" to children from Holland Elementary School, discuss the importance of reading, then hop on with the students for a tour of Boston's historic sites. Scheduled to be in attendance are first-round pick Kelly Olynyk and veteran big man Kris Humphries, as well as DeShawn Sims, Chris Babb, Phil Pressey, MarShon Brooks, Damen Bell-Holter, and Kammron Taylor. Jordan Crawford, a holdover from last year's roster, is slated to be there, too. They'll be riding around from 3-4:30, so keep an eye out -- because after this we might not see a Celtic on a duck boat again for a while. 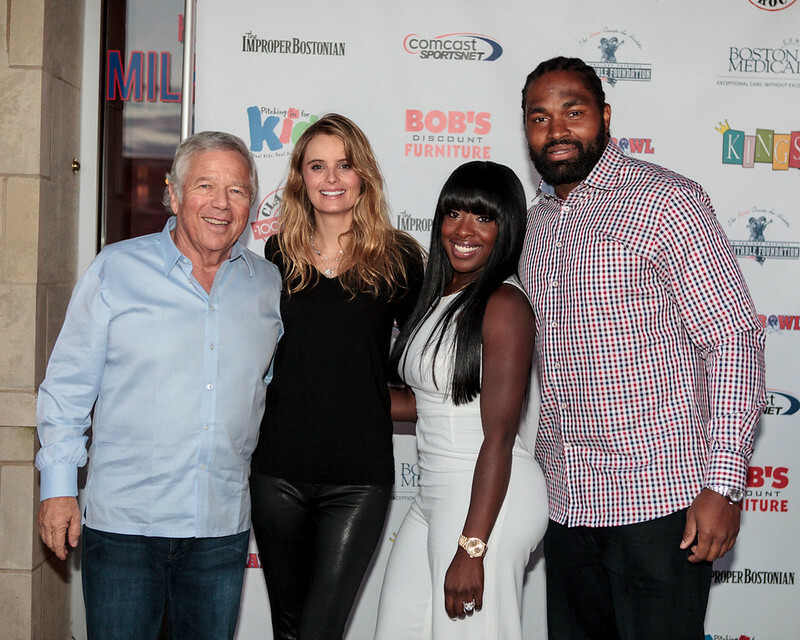 Led by owner Robert Kraft, a number of current and former Patriots joined linebacker Jerod Mayo at King's in Dedham on Monday night for the fourth annual "Mayo Bowl" -- which raised money for two charities close to the hear of its host. In total there were more than 400 guests on hand for the event, with proceeds benefiting the Boston Medical Center -- which last year unveiled the "Mayo Zone" in its pediatric waiting room -- and Pitching in for Kids, which aims to improve the lives of children around New England. 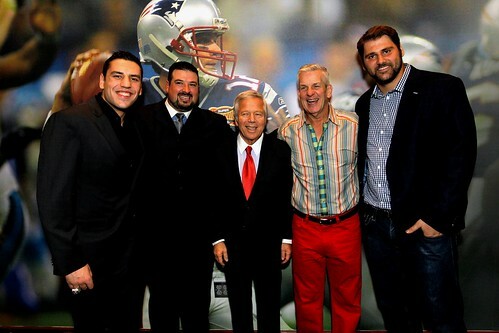 The guest list was star-studded, too, with Tom Brady, Tedy Bruschi, Danny Aiken, Dont'a Hightower, Brandon Spikes, Julian Edelman, Chandler Jones, Vince Wilfork, and Hall of Famer Andre Tippet among those participating in what has become one of the best-attended charity events on the club's calendar every year. Usually near the start of the season, some players said last year that it has even become something of a bonding experience they look forward to. This year the boss brought his girlfriend, Ricki Noel Lander, and she was at Kraft's side as they posed with Jerod and Chantel Mayo in the photo above. 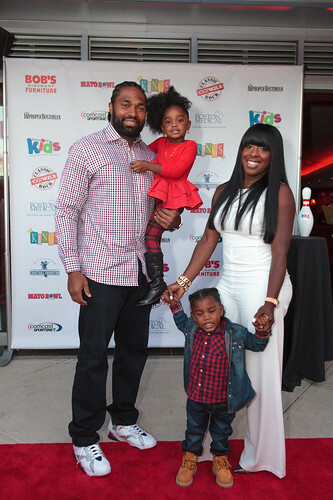 The Mayos also posed with their kids for the photo below, as did ex-Patriot Matt Light with his bowling squad in the picture below that. No word yet on how much money was raised this time around, though the 2011 and 2012 undertakings reportedly raised close to $250,000 for the two charities. A good time well spent, it would seem. 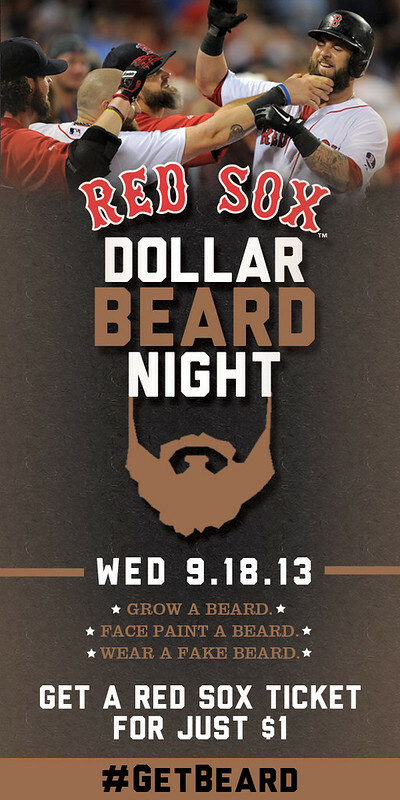 The Red Sox are likable, they have a collection of tremendous beards, and they're sizzling to the degree there's a chance that next Wednesday could very conceivably be the night they clinch their second American League East title in 18 years. But a Wednesday night in September is a Wednesday night in September. And Fenway Park is no longer immune to the realities of the calendar, the school year, or autumn weather. The sellout streak must be rolling over in its grave. The Red Sox, the American Red Cross, and Beth Israel Deaconess Medical Center will host the 11th annual Day of Remembrance Blood Drive at Fenway Park tomorrow, September 11, from 7:00 a.m. to 2 p.m. Those who are eligible are invited to donate blood in honor of those lost in the 2001 terrorist attacks. This year’s drive will also commemorate Boston Marathon survivors. The event is presented in cooperation with the Boston Police, Firefighters, and EMTs. Donors can enter the ballpark through Gate D, on the corner of Yawkey Way and Van Ness Street. A blood donor card or driver’s license, or two other forms of identification, are required at check-in. Individuals who are 17 years of age (16 with parental permission in some states), weigh at least 110 pounds and are in generally good health are eligible. High school students and other donors 18 years of age and younger also have to meet certain additional height and weight requirements. Since its inception in 2003, the annual blood drive has collected nearly 9,000 units of blood. In addition to Fenway Park, the Day of Remembrance Blood Drive will include a location at Faneuil Hall. Appointments to donate blood can be made by calling 1-800-RED CROSS (1-800-733-2767) or by visiting redcrossblood.org. The Bruins are back. And they've already got a win under their belt. 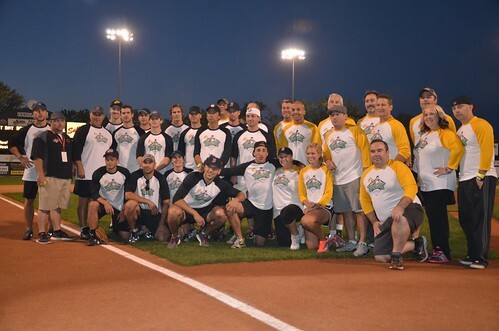 Granted, it was over a team of assorted media types and radio personalities, and it was just a charity softball game. 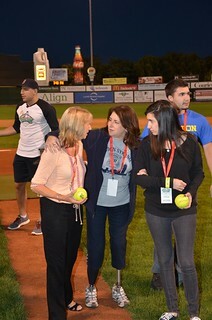 But much of what may be Boston's most likeable team came out in support of Milan Lucic on Thursday night and helped him raise money for Align Credit Union's charitable partners and the Celebrities for Charity Foundation -- while posting a 14-0 thumping of the Rocks in the fourth-annual event at Lowell's LeLacheur Park. 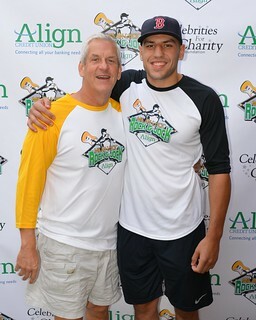 The pitcher forced to field Marchand's bunt was comedian Lenny Clarke, whose Rocks teammates included Melissa from Hot 96.9 FM, Krazy Kulo and Ramiro from Jam'n 94.5, both Toucher and Rich from 98.5 The Sports Hub, Pete McKenzie from WZLX (100.7), Lori Grande and John Willis from Country 102.5, Karson from Mix 104.1, Joe Haggerty from CSNNE.com, Joe Amorosino from Channel 7, Jamie Erdahl from NESN, and comedian Dave Russo. Not the stiffest of competition, apparently. But a win is a win. Especially in the name of a good cause.